Behind every successful man is a woman. Behind the fall of a successful man is usually another woman. Sophie Mayhew looks like she has the perfect life. Wife of rising political star John F Mayhew, a man who is one step away from the top job in the government, her glamour matches his looks, power, breeding and money. But John has made some stupid mistakes along the way, some of which are threatening to emerge. Still, all this can still be swept under the carpet as long as Sophie 'the trophy' plays her part in front of the cameras. But the words that come out of Sophie’s mouth one morning on the doorstep of their country house are not the words the spin doctors put in there. 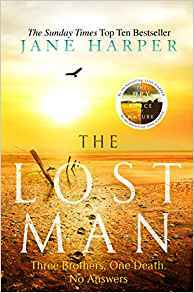 Bursting out of the restrictive mould she has been in since birth, Sophie flees to a place that was special to her as a child, a small village on the coast where she intends to be alone. 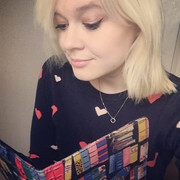 But once there, she finds she becomes part of a community that warms her soul and makes her feel as if she is breathing properly for the first time. Sophie knows she won't be left in peace for long. Now she must decide: where does her real future lie? Sophie ‘The Trophy’ Mayhew dedicates her life to helping her politician husband John F Mayhew with his rise to the top of the government. Although she sometimes comes across as cold and aloof, Sophie has always stood beside John through thick and thin. She always looks the part and does as she’s told. Until one day when John publicly betrays her. Sophie decides to flee from the life which she has settled for for so long – but where will she go? Of all the places Sophie expected to find herself, the small village in Yorkshire where she grew up wasn’t top of her list. Sophie has never had any desire to return, but when she revisits the small village she finds herself feeling properly at home for the first time in her life. The community, the freedom, the friendships – but can Sophie ‘The Trophy’ really adjust to such a different way of life? There are some things in life that guarantee huge excitement in my world. Christmas is one. 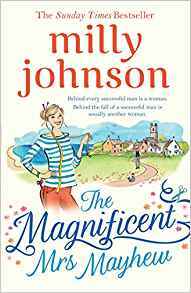 My birthday another – but another momentous event that is guaranteed to have me jumping up and down in excitement is a new Milly Johnson novel. Sophie was a wonderful character, I loved her strength, her personality and her determination. I enjoyed reading about her time at boarding school and was desperately hoping that she would find some of her feistiness and determination in adulthood. I hope that - in true Milly Johnson style - we become acquainted with her again, along with some of the other characters in this novel. Milly's writing is as wonderful as ever as she creates a believable and beautiful story. Once you have turned the first page you will have trouble putting this down. It has all the elements of the perfect novel - humour, romance, drama & it's a real page-turner, too. 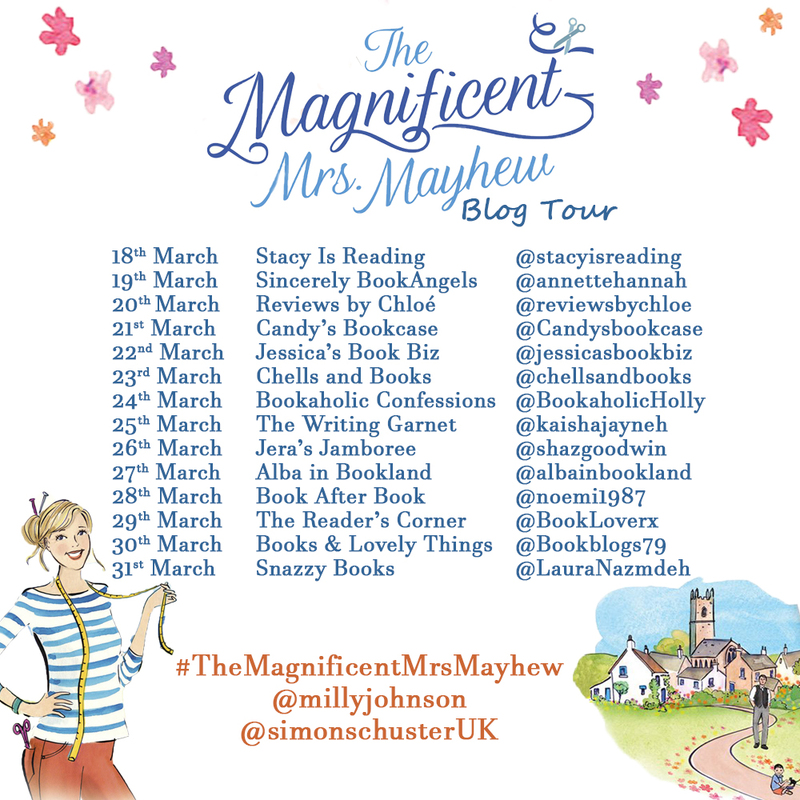 The Magnificent Mrs Mayhew is like a hug in book form and I absolutely LOVED it. 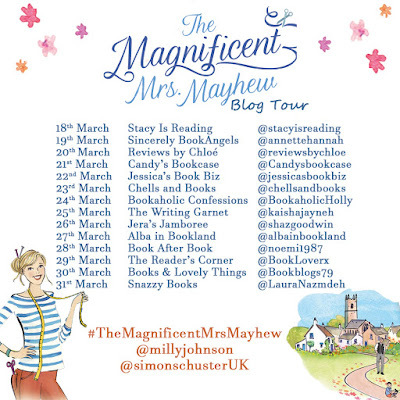 A huge thank you to Annabelle at ed pr & to Milly Johnson for the opportunity to be a part of the blog tour for The Magnificent Mrs Mayhew.